The SPDR S&P Homebuilders ETF (XHB) is up just over 1% in the past month after showing signs of a breakout in February. Although Lennar (LEN), XHB’s sixth-largest holding at a weight of 3.43%, delivered solid quarterly results before the opening bell Thursday, XHB is trading slightly lower after the National Association of Realtors said existing home sales dipped 0.4% last month. Some analysts see a cautionary tale for XHB as shares of homebuilders now look richly valued, reports Victor Reklaitis for MarketWatch. 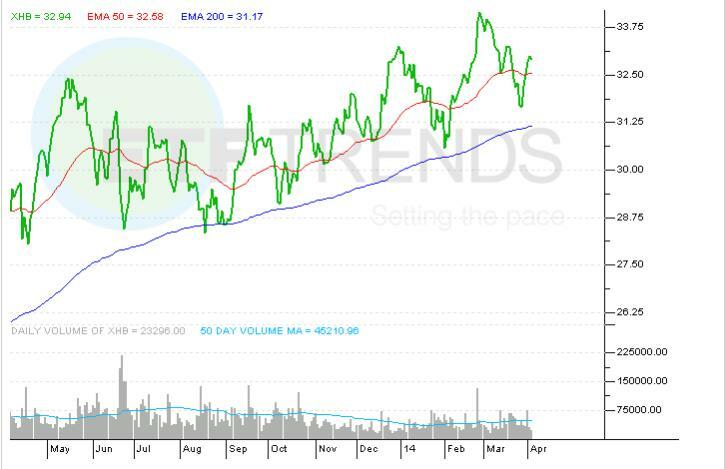 Should shares of homebuilders enter a prolonged run of weakness, XHB would be vulnerable, but the iShares U.S. Home Construction ETF (ITB) would be even more so. The $1.6 billion ITB is the purer homebuilders ETF with Dow component Home Depot (HD) being the only member of ITB’s top-10 lineup that is not a homebuilder. ITB’s top-10 lineup is 62.6% of the ETF’s weight. ETF Trends editorial team contributed to this post. Tom Lydon’s clients own shares of XHB.